This one was actually featured on my community newspaper thing! Well, sorry for the lack of updates these days, but I do have a valid reason for it: I busted my right arm GOOD, and having to use it for state-level table soccer tournaments, the newspaper AND TG would be too much, so I had to wait out until actually doing stuff for this site. But fear not, TG, goes on and will go o for a long while, as far as I'm concerned. Oh, and if you post a comment here, you most definitively were answered by me, just go back to the page you submitted your comment to! Stay tuned, folks! This IS trolling. Good job! Yeah, that's the point! 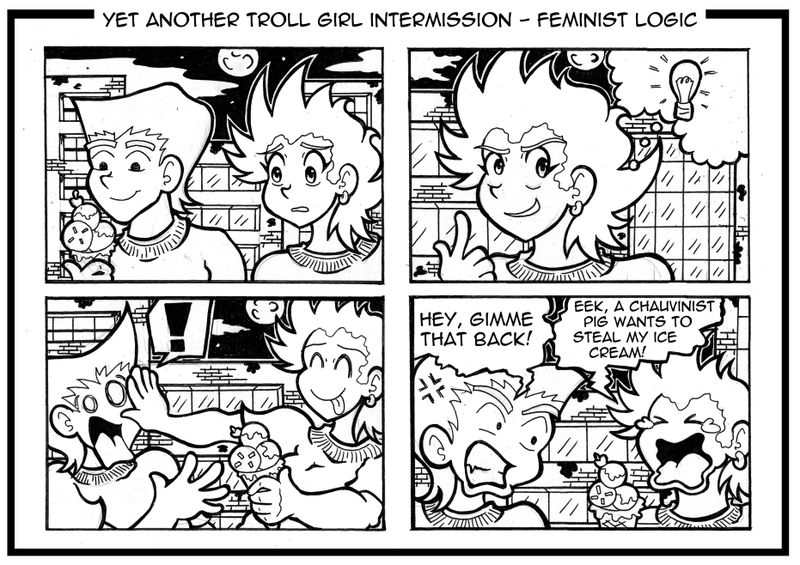 However, I must say this is a strip about misguided feminists, not women in general (y'know, just to avoid misinterpretations). Actually, I'm considering ideas such as exploring more this snarky side of Amelia. I think it would be a good tangent to explore. Her nasty side, not just her awkward and clumsy side. What would she do if she wanted to ruin somebody's life? Sometimes I wonder what she's capable of. We've seen so far a few hints of how she wants to screw Weir, but I can't tell the exact way she intends to do so.